Ever wondered just who is listening in to your conversations or simply checking out the kind of messages that you have been sending back and forth on your smartphone? A secure device might seem to be something that is within the realm of science fiction, but DarkMatter Group thinks otherwise, recently rolling out its next generation of mobile devices that will provide additional peace of mind whenever you communicate digitally with another person over a smartphone. 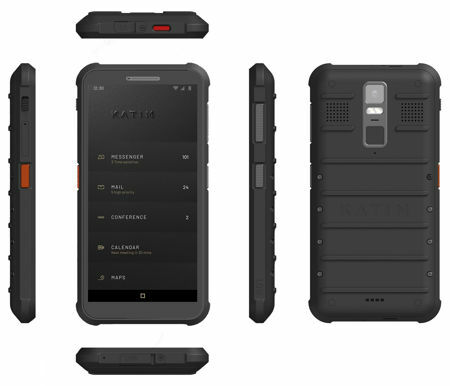 Enter the Katim R01, touted to be the first ultra-secure smartphone in the world that has been specially designed to withstand extreme field conditions. Tough and secure? Sounds like a dream to us. The Katim R01 might not be the smartphone for everyone though, but if there is a handset that you would like to fall back upon during times of emergency, then it should be a decent candidate. Specially designed to cater to individuals who operate in defence and the emergency services, the Katim R01 is also equally at home in the hands of those who are involved in construction, mining, transport, energy, and oil and gas industries. Being smart and secure, it is also extremely durable. Feel free to make use of its full suite of apps that arrives encased in a hardened, tamper-proof hardware and a hardened Android 8.1 Oreo operating system. Accompanying it would be a hardware-based crypto root of trust, where it is up to the task of meeting not one, but two separate military level standards for resilience. Drop it, run it over by accident, or immerse it in water for up to 30 minutes and it will still keep on running without missing a beat. Other supporting features of the Katim R01 include good grip, extra loud audio for noisy environments, dedicated buttons for Push-to-Talk and SOS, and a touch screen that continues to work even when you wear a glove. Powered by the Snapdragon 845 chipset, you can be sure that performance is not going to be an issue with the Katim R01 ultra-secure smartphone.